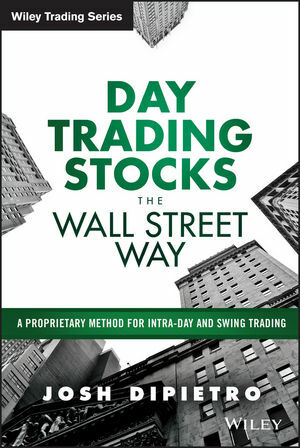 Day Trading Stocks the Wall Street Way: A Proprietary Disclosure on Intra-Day Trading and Swing Trading Equities provides a real-world guide to successful day trading, and gives you the tools, techniques, and tested, reliable methods you need to trade like the pros. Written by a seventeen-year day trading veteran, this guide talks you down from the industry hype to give you a realistic grounding in self-discipline, consistency, and patience while teaching you the hard skills you need to have a real chance of success. Avoid losses by swerving from the typical beginner's path of seminars, software, and major brokerage houses, and instead develop the insights that lead to real, long-term profits. With an engaging and humorous tone, the author relates his own experiences and lessons learned to teach you the do's, the don'ts, and the ingredients for success. You'll discover Josh DiPietro's FUSION TRADING SYSTEM—a proven method developed from years of reliability testing. He'll show you how intra-day setups and swing trading setups can be merged to develop a perfect trade. The surest path to failure and tremendous financial loss begins with the over-eager, overly optimistic amateur trader who sees day trading as a quick and easy path to wealth. This book gives you a much more realistic outlook, and the fundamentals you need to make the most of the market. A poorly defined trading approach will cost you more money than you will make, rendering your day trading venture a potentially damaging net loss. Day Trading Stocks the Wall Street Way: A Proprietary Disclosure on Intra-Day Trading and Swing Trading Equities teaches you the avoidance of loss, the discipline, and the transparent strategies of success, so you can play the market to win. JOSH DIPIETRO is a professional day trader who started out in 1998, over seventeen years ago making the rounds at private equity trading floors in the Financial District of Manhattan. He is the author of The Truth About Day Trading Stocks, as well as numerous articles, all of which support his passion for educating tomorrow's trader. Josh operates his online trading room and coaching program, where he can be reached at www.EmailDayTraderJosh.com and www.DayTraderJosh.com or at 1399 9th Avenue #1211 San Diego, CA 92101.